Many people have small pouches in their colons that bulge outward through weak spots, like an inner tube that pokes through weak places in a tire. Each pouch is called a diverticulum. 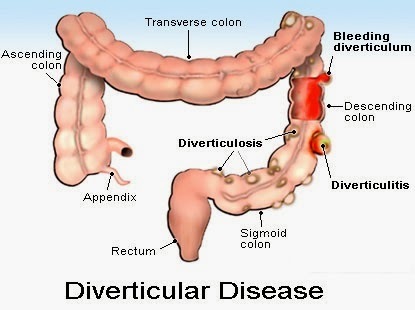 Pouches (plural) are called diverticula. 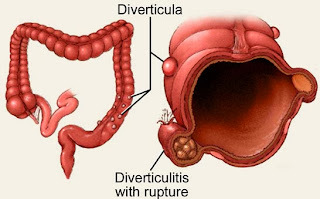 The condition of having diverticula is called diverticulosis. 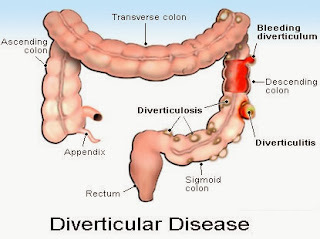 About half of all Americans age 60 to 80, and almost everyone over age 80, have diverticulosis. Though not proven, the dominant theory is that a low-fiber diet is the main cause of diverticular disease. The disease was first noticed in the United States in the early 1900s. At about the same time, processed foods were introduced to the American diet. Many processed foods contain refined, low-fiber flour. Unlike whole-wheat flour, refined flour has no wheat bran. Constipation makes the muscles strain to move stool that is too hard. It is the main cause of increased pressure in the colon. The excess pressure might be the cause of the weak spots in the colon that bulge out and become diverticula. Until recently, many doctors suggested avoiding foods with small seeds such as tomatoes or strawberries because they believed that particles could lodge in the diverticula and cause inflammation. However, this is now a controversial point and no evidence supports this recommendation. Individuals differ in the amounts and types of foods they can eat.